Smothers (inset) and Chicago police personnel at the scene of his arrest in October 2016. 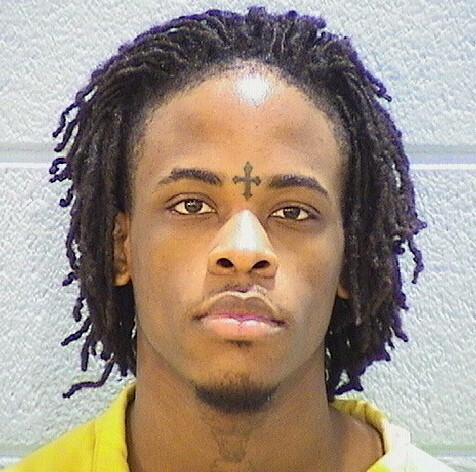 A man who shot three people and threatened two cops with a firearm in Lakeview has reached a plea deal that will have him out of prison less than two years from now. Ricky Smothers, 23, pleaded guilty to three counts of aggravated battery with a firearm and two counts of aggravated assault of a police officer with a firearm in exchange for a seven-year prison sentence. With credit for 552 days spent in jail awaiting trial and Illinois’ standard 50% sentence reduction for anticipated good behavior, Smothers will be paroled on March 13, 2020, according to state records. Judge William Hooks approved the deal. Early on October 29, 2016, Smothers shot three people outside of a house party in the 2900 block of North Sheffield, according to charges. He then threatened the cops who chased him into an alley behind the 1000 block of West Oakdale moments later. Two men and a woman, all in their 20's, suffered minor injuries from gunshot wounds to their lower extremities. “I heard six shots,” a woman who lived nearby told CWBChicago at the time. “There was a guy on the ground surrounded by police screaming for a while before an ambulance came.” Police found the other two shooting victims nearby. Smothers was sentenced to four years total for the three shootings plus a consecutive three years for assaulting police. A man who helped beat up and rob a 63-year-old world-renowned expert on ancient Egypt in Lakeview two years ago has been sentenced to 21-years in prison. Juan Askew, 20, pleaded guilty to one count of aggravated battery causing great bodily harm and was found guilty in a bench trial of armed robbery, unlawful restraint, and aggravated battery in a public place. Judge Joseph Claps oversaw the trial and sentencing. Askew is scheduled to be paroled on December 31, 2026. On the afternoon of July 10, 2016, Askew and 21-year-old gang member David Shabazz tackled the victim, beat him, and robbed him at gunpoint near the victim’s home in the 1000 block of West Barry, prosecutors said. Witnesses told CWBChicago at the time that the victim was bleeding after being knocked to the ground, kicked and punched by the two men. Shabazz reached a plea deal last summer that gave him a 13-year sentence for his role in the attack. He was ordered to serve at least 85% of his sentence and is scheduled to be paroled on January 1, 2026.